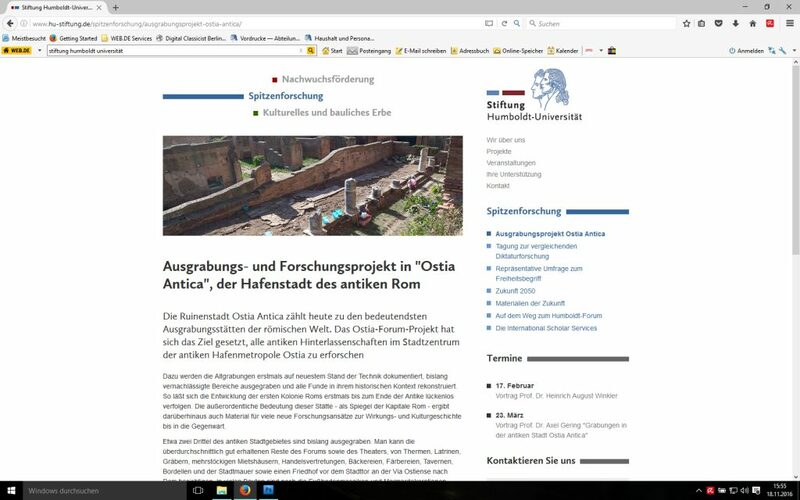 Thanks to the Stiftung Humboldt-Universität (SHU) and based on a very substantial private donation in 2015/16, the Ostia-Forum-Project has been given the chance to develop a 6-year-plan of excavation-, documentation- and publication-efforts until 2022 (see section 2015 “Perspectives”. For actual details, visit the webpage of the Stiftung, see picture below). Two new stipendia, one for a PhD-, another for a habilitation-project, and a new ‘Stiftungs-professorship’ as far as a budget for material, equipment and short-term-jobs (‘Werkverträge’) set a framework for the continuous and extended efforts on several aspects of the project’s evolution. At the same time, the project’s main office has moved from Ziegelstraße 13c to the centre of the Winckelmann-Institute for Classical Archaeology, the former office of Prof. Rößler inside the library of the Winckelmann-Institute (that is in the main HU-University-building at Unter den Linden 6). Based on an upgraded infrastructure, new perspectives and many new supporters, the summer-campaign of 2016 could begin! 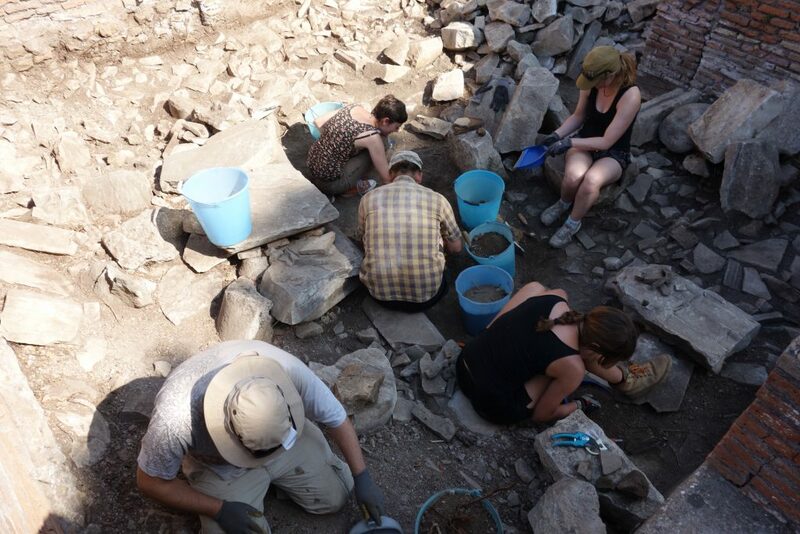 As in former years, the annual summer-excavation campaign remains the integral part of the project. 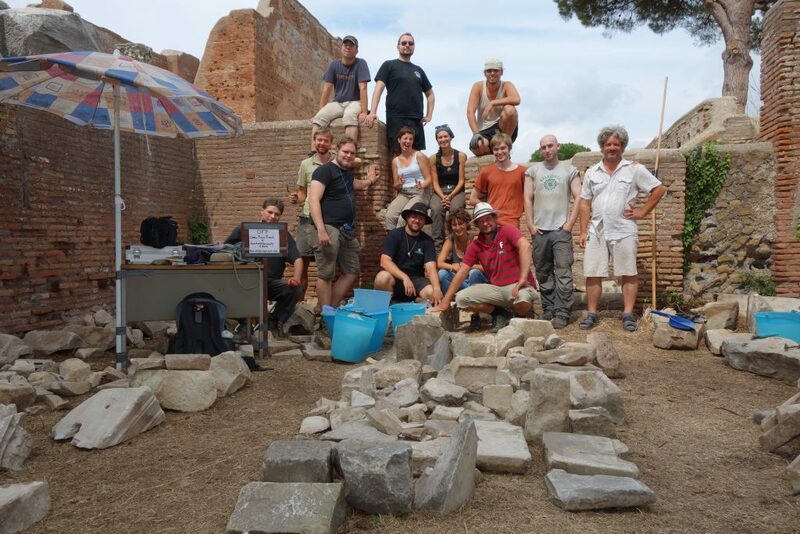 In late July 2016, after receiving all necessary project-funding, the first car of the excavation-team left Berlin and moved immediately towards Rome. 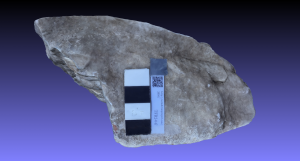 The tasks of the first two weeks were to renew the technological equipment, install new programs, mainly 3-D-tools on our laptops, and to prepare a database for systematic documentation methods on finds and their contexts. All this had to be prepared before the middle of August (straight after the famous “Ferragosto”-holidays in Italy, where almost everything remains closed), when the main team consisting of 28 students and researchers from Berlin, Denmark, Italy and Hungary were scheduled to start the work of a huge amount of finds . 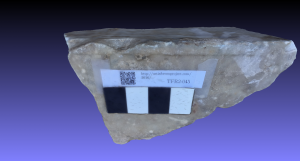 There was indeed a lot of work expected: Several hundreds of high-quality decorated marble fragments from deposits consisting of several thousands, mainly non-diagnostic, stones were to be selected, measured, drawn and digitally documented based on the survey-activities of 2015. 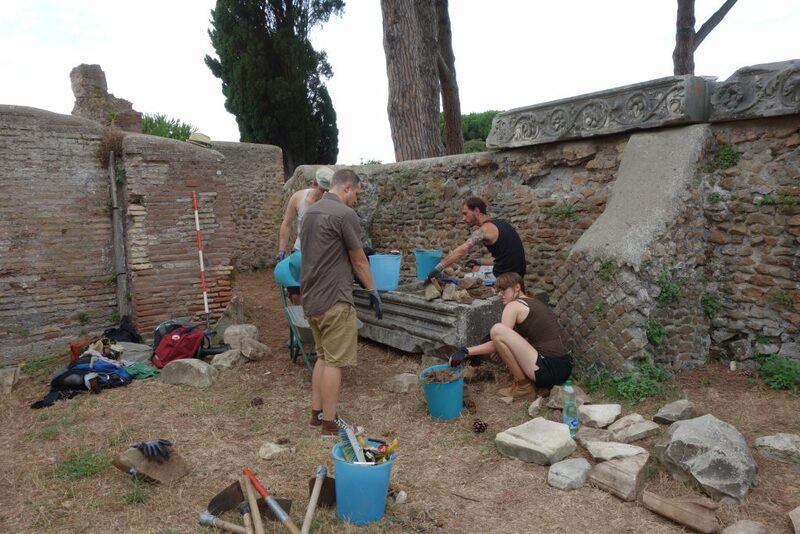 The first half of the team arrived at Ostia at the 16th of August for the official opening of the excavation (see picture below). 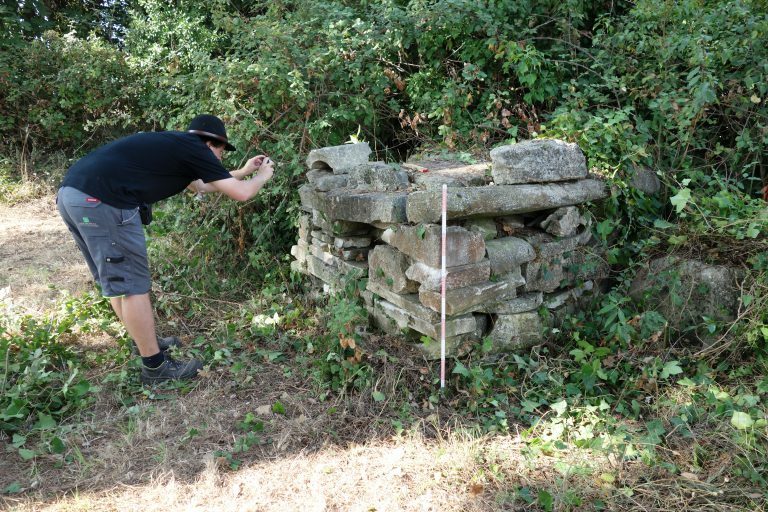 On the first day after Ferragosto, a survey of previously neglected marble-deposits, often hidden under decades of modern vegetation, was begun (see picture below). 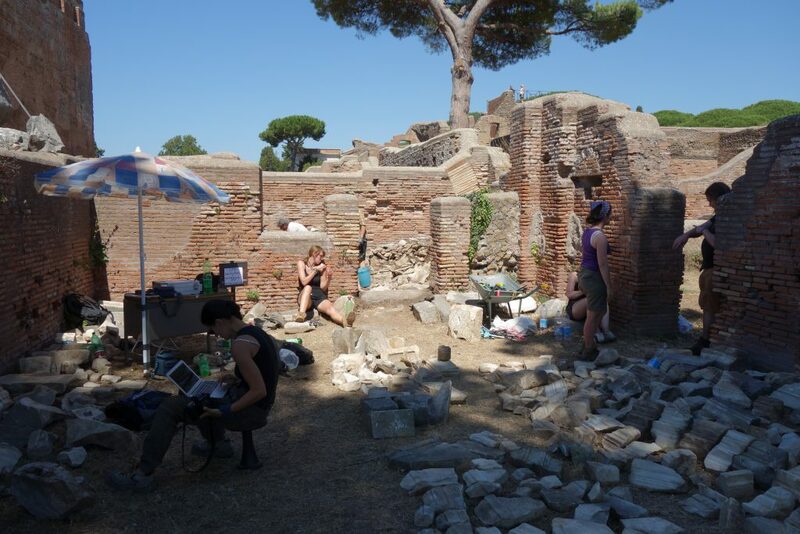 Since 2012, the first non-documented marble-fragments of the Forum, remains of old excavations or even older lime-kilns, became a centre of interest for the Humboldt-team’s activities. 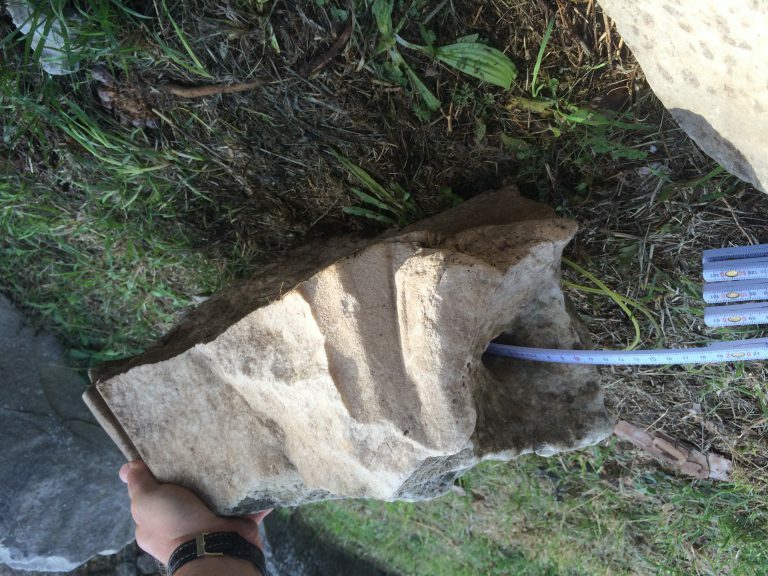 In 2014, the first deposits with a non-disturbed late- and post-antique stratigraphy were documented (see section Campaign 2014, chapter 1-5). 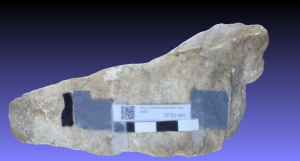 The campaign of 2015 continued with this same task, where mainly recent marble-deposits were scientifically documented and processed for the first time. Nevertheless, there were many more stone-deposits, either just overgrown (see picture below) or completely hidden underneath the earth, to be analysed (see plan below bottom). 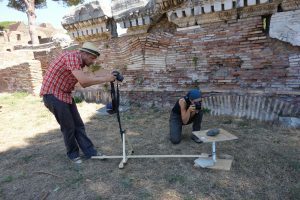 Besides that, we looked very much forward to the visit of Roberta Geremia-Nucci, who already had started the documentation of the marbles connected to the temple of Roma and Augustus (TRA) in 2005 (Geremia-Nucci 2013). 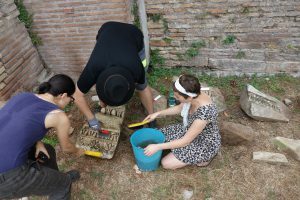 Again, we want to express our deepest gratitude to Roberta and of course also to the Superintendence of Rome and the directors of the Scavi di Ostia, namely Paola Germoni and Cinzia Morelli, who again allowed us to work on and work up the rich material of previous excavations (including our newer excavations since 2010) of the Forum. 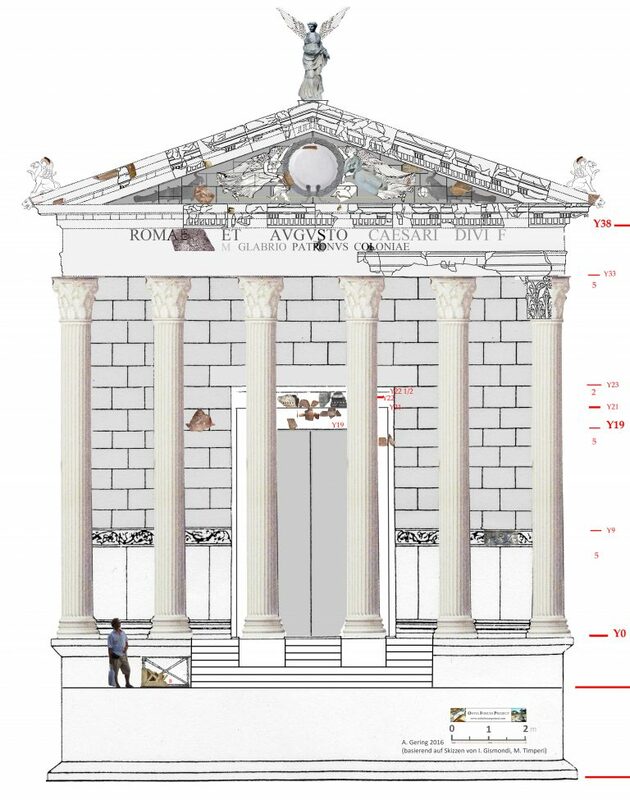 Actually, we took up the work from where Roberta had stopped in 2005, and where we already had begun in 2015: In and around the fundament-area of the temple of Roma and Augustus (TRA, see pictures below). 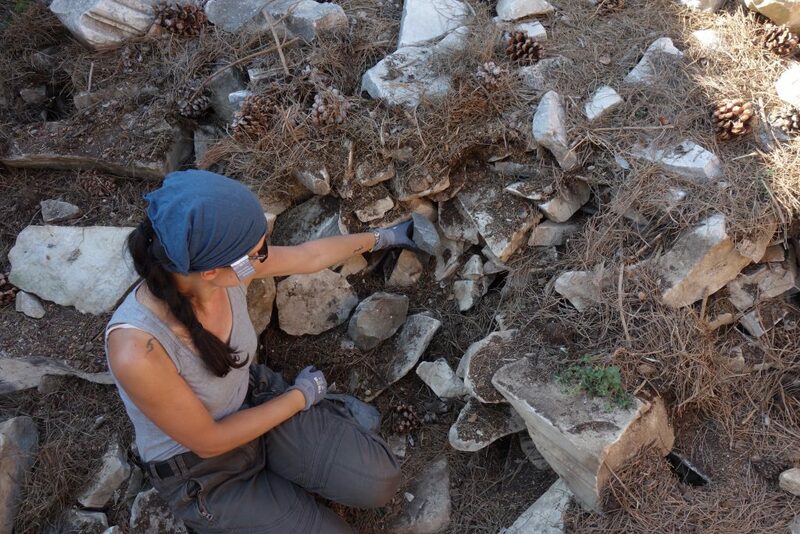 By simply cleaning the marble pile and removing the pine needles or earth around some of the fragments (see picture below), we found some important architectural marble-elements, which seemed lost. On the excavation’s first day they were actually ‘re-found’ exactly in a position to which they had fallen from a place, where Axel last had recorded them on photos in 2007. 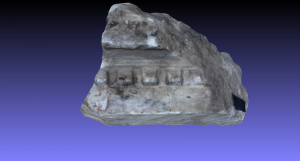 These elements of the temple TRA had to be recorded with several hundreds of photos from all sides in order to create proper high-resolution-3-D point clouds (a method now widely used based on a simplified workflow thanks to professional software. In earlier campaigns, our cooperation-partners and we had to do the more fundamental research on the methods on our own). 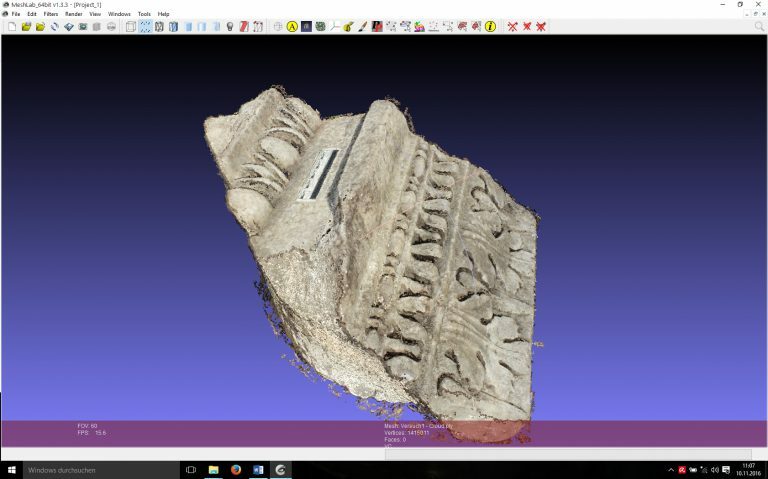 By looking at all sides, working traces and dowel-holes of these fragments (for an example, see pictures below: the top picture is a cleaned point cloud and the remaining are the meshed model), it is now possible to reconstruct the exact position of the complete cornice and framing of the temple-door and the thickness of the front cella-wall in a different way than we expected in 2015 (see picture below bottom). 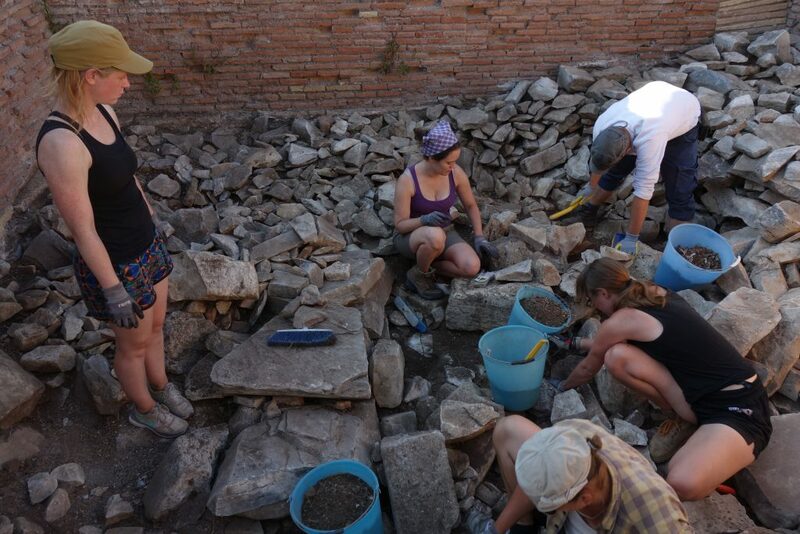 The first excavation week after Ferragosto ended with the complete sorting of all marbles in the temple-fundament TRA. However, sorting stones with and without decoration alone is just the beginning: After careful cleaning with water (see picture below, left), Marco and Laura had to continue the work for some weeks to record all architectural elements in detail (see picture below, right). 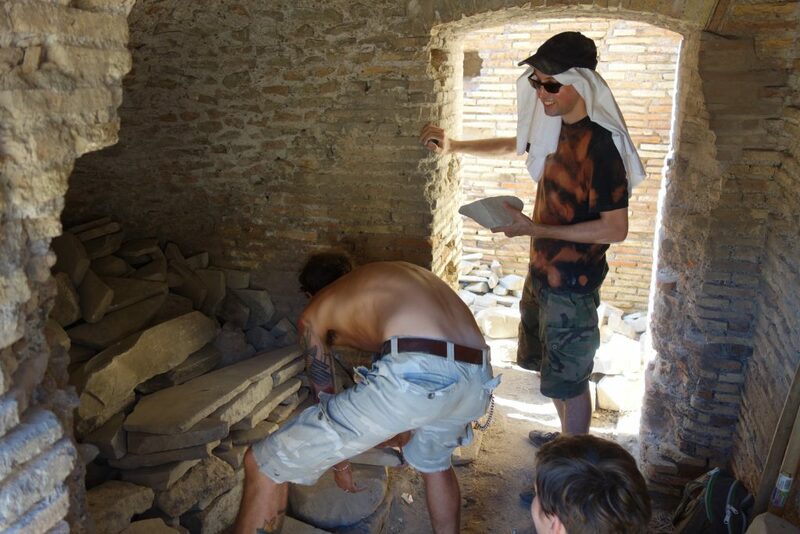 Marco was quite enthusiastic from the beginning, because Ostia’s marble-piles offer a high density of diagnostic fragments in a very limited and dense space, especially compared to the huge stone desert of Petra, where he normally works on his PhD-thesis about architectural decoration. 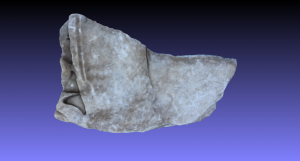 In the last week of August, the centre of our activities extended to a quite recent stone-deposit located underneath a staircase in the Forumbaths (see 3-D-reconstruction below). The deposit can be dated to the 1930’ies (see the plan above: PFB 1; see pictures below). 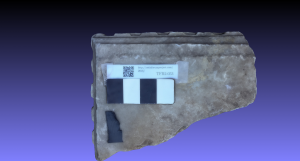 Even though the deposit is modern and quite ‘recent’, we still found lots of extremely interesting material regarding our planned reconstruction of the main marble-buildings of Ostia’s city-centre! 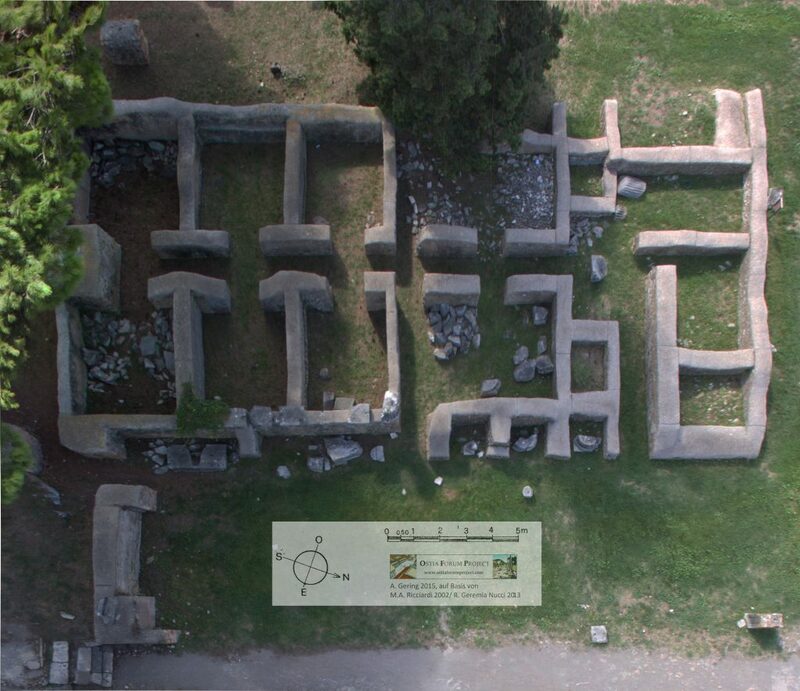 Roughly 75% of the diagnostic architectural decoration and marble-furniture originate from the surrounding Forumbath’s area including its ‘Palaestra’ (compare the unusual gameboard with animal-graffiti, see picture above), but the remaining 25% can be attributed to the Augustan temple TRA (by simple stylistic, typological and measurement-comparisons), the Flavian Forumsbasilica, the Hadrianic Capitolium (Ostia’s main temple) and the Severan ‘Tempio Rotondo’, a round temple dedicated to the Imperial cult. Ostia’s marble-deposits show that all marble-buildings of the centre were dismantled intentionally at a certain time, but the sequence of these destruction-processes was never before analysed in detail or based on a statistically representative number of fragments. 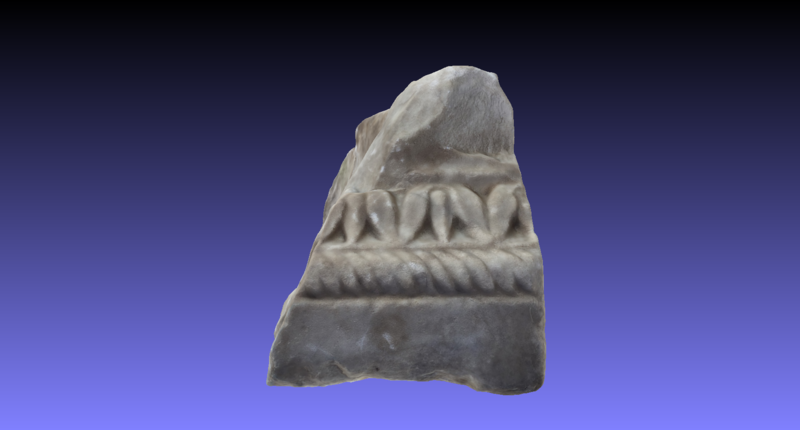 At first, we collected all marble-fragments with a clear decoration-system which can be dated in Augustan times or later periods (see pictures below). 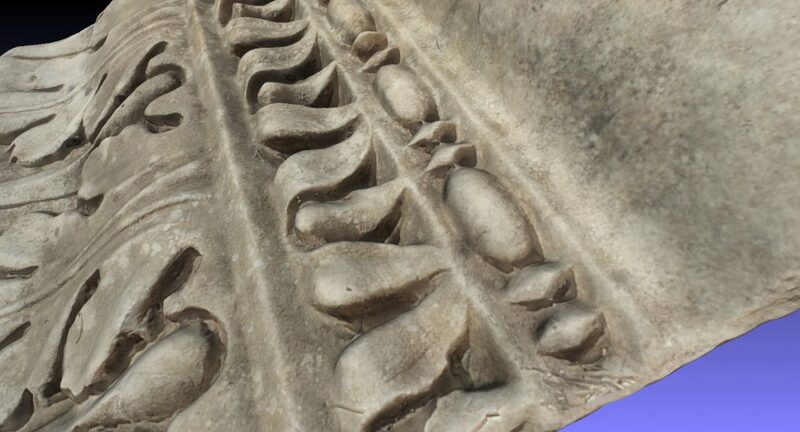 Due to the dimensions, most of these marbles belonged to smaller architectural ensembles like altars or aediculae (small niches with little pediments), which were frequent inside the cella of a temple or inside porticoes. 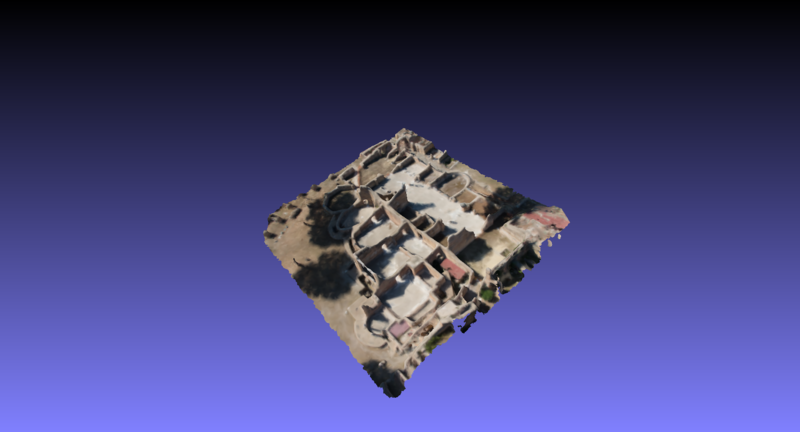 Based on statistics, it became clear that Augustan buildings, as the temple of Roma and Augustus (TRA), were the biggest source of material for reuse and the earliest monuments, which were dismantled intentionally for this purpose. 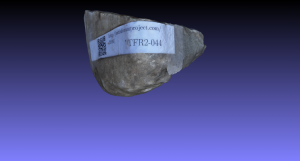 A systematic workflow was developed, where all fragments were registered by numbers and QR-codes, before they were photographed and documented in 3-D. The name of the deposit is characterized by three letters, followed by a room number (if the area consisted of several rooms) and the individual find’s number (see pictures below. 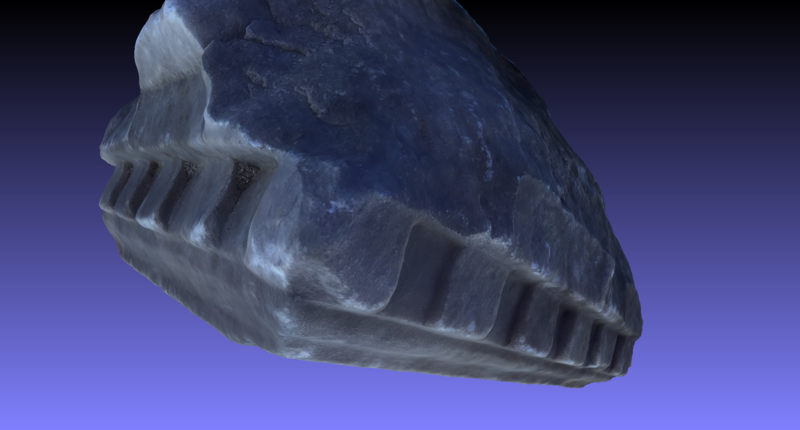 Attention: the scale is in inches, not centimetres…). 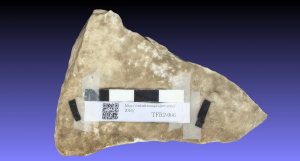 Once our catalogue will be online, you can have direct access to the fragments and their measurements via a simple smartphone, but this step will take us some more time to process! 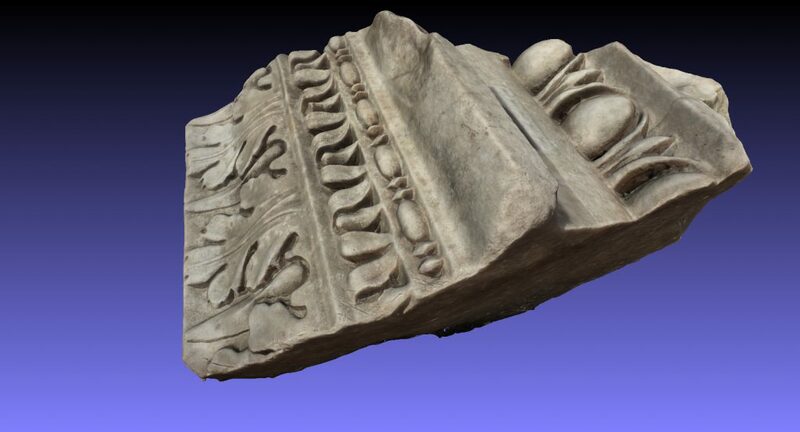 Since 2014, we have known that the majority of marbles from the temple TRA was recycled already in Late Antiquity. 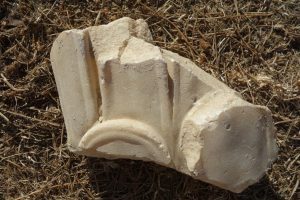 This is especially evident along the southern part of the Forum and along the southern Cardo, where pediment-reliefs and statues or decoration-elements from inside the temple-cella were found in shops. They were mostly placed there by the excavators of the early 20th century after they had been found on top of the southern Cardo between 1921 and 1924. 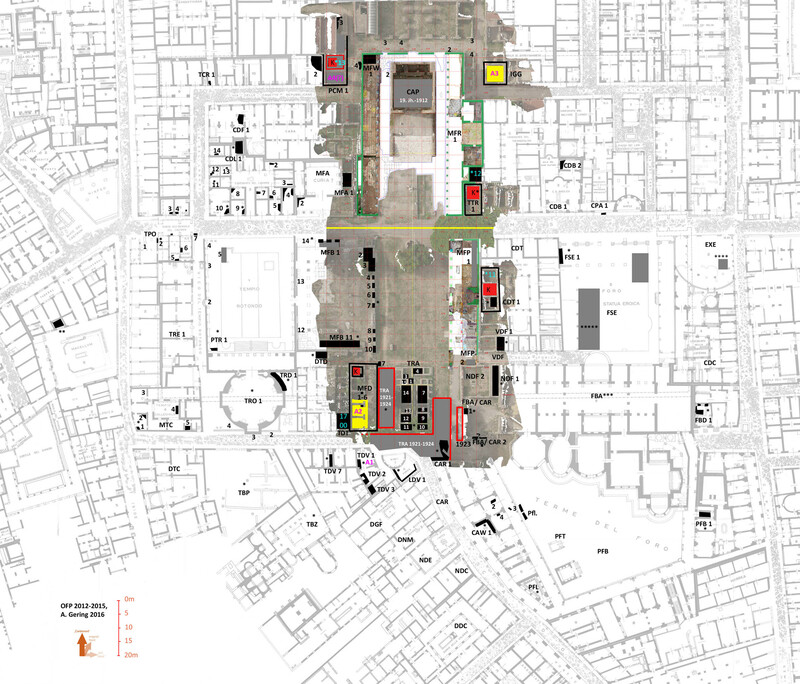 However, limited excavations in 2012 and 2014 had already showed that in similar shops in the south part of the Forum and along the Cardo (as TDV) there obviously was a late 5th and 6th century AD marble-business concentrated. As for example at Sagalassos in Turkey, sorted piles of building-material were stored in shops around the Forum (around the Agora in the case of Sagalassos) for local recycling, production or simple selling as spolia. 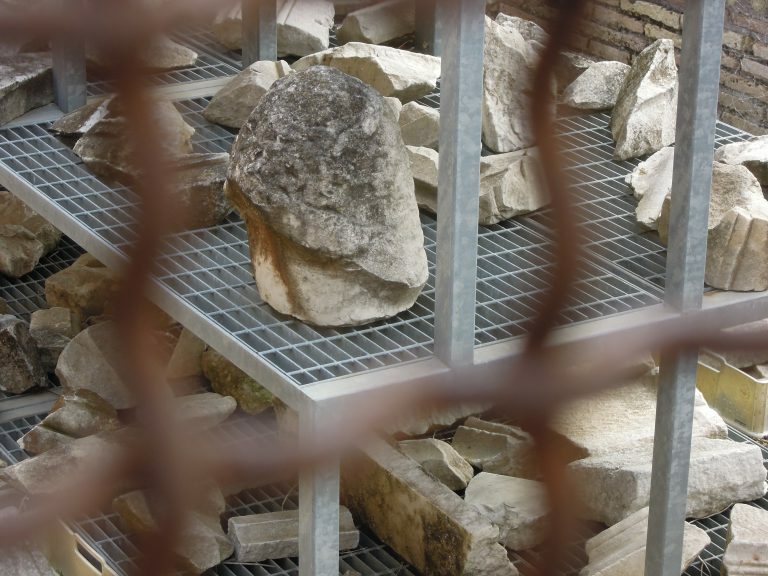 During the old and widely undocumented excavations, these marbles were obviously not moved too far from their find-spot, which therefore – based on a representative number of finds – is statistically significant to reconstruct the last phase of Ostia’s urban development from a monumental Forum to a marble-warehouse or builders’ merchant. 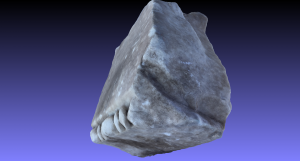 Thus, it is necessary to cross-check possible resembling fragments in all marble-deposits of the city-centre. 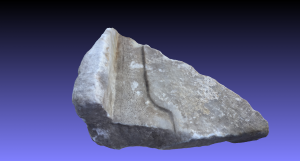 One example: A newly discovered over-life-size statue-fragment from the temple TRA (see picture below, top) could be paralleled with other fragments. 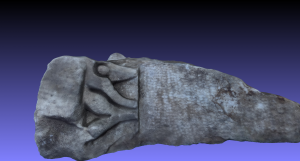 These consist of a marble arm (see picture below, middle) from the Forumbaths-deposit (PFB 1, see plan above) and a neck-fragment, which was originally inserted (‘Einsatzkopf’) into a statue, found by Roberta in 2005 (It is now stored in the Piccolo Mercato, see picture below, bottom). 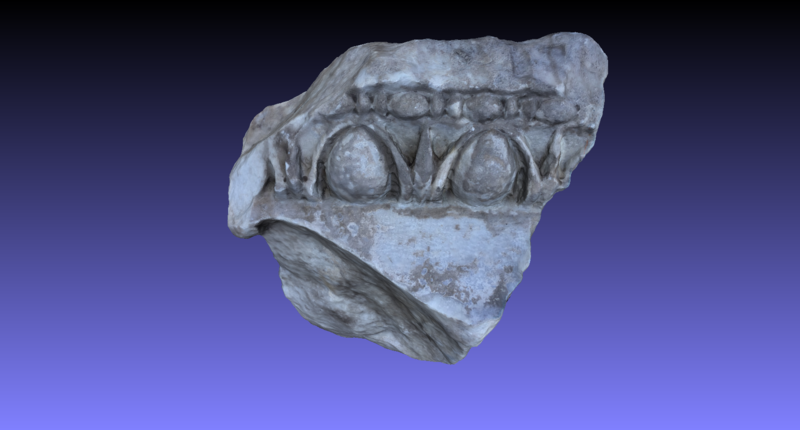 The final evidence will emerge, when we have all three fragments processed as 3-D-models, which can show if they actually fit to each other. By the end of August, we had finished deposit PFB 1, the so-called “smelly-snake deposit” (it owes its unofficial nickname to the fact that we had a stratigraphy of 50 cm of rat-leftovers and below that, a comfortable home of snakes…). 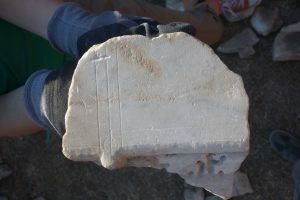 Beside the usually high amount of wall-veneers and pavement-slabs, also statue-fragments came to light (see picture below left). 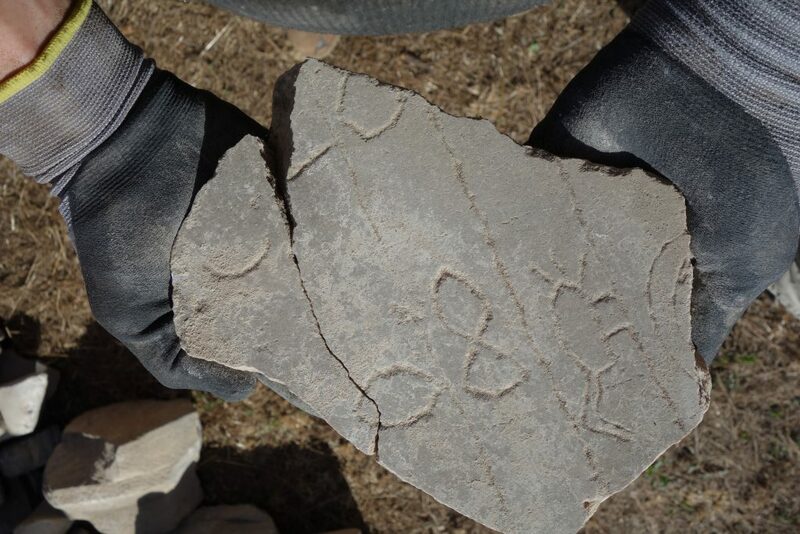 Another interesting group of finds were elements of architectural decoration, which still show traces of lines for cut-out. 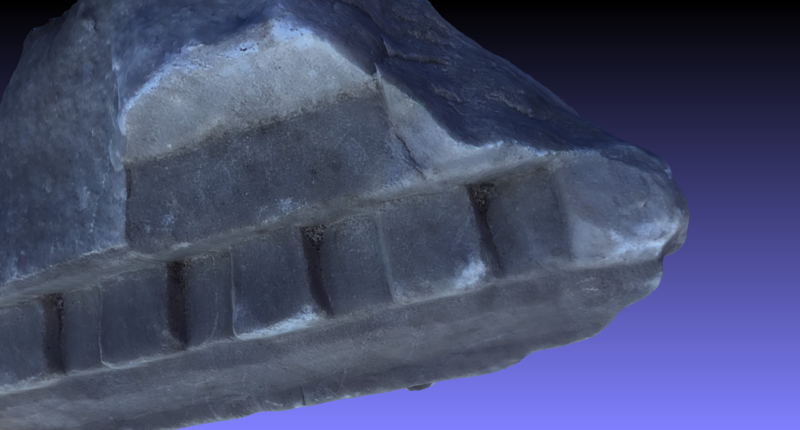 This shows that they were left in a condition not finally polished (see picture below right). 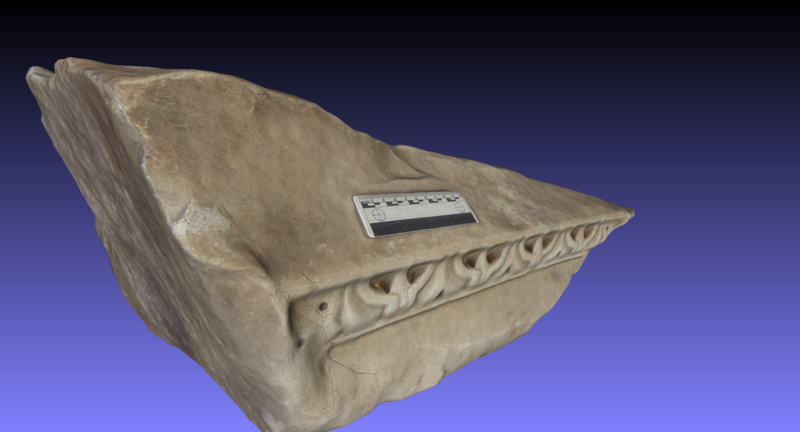 It is interesting to note that there is a high number of such obviously unfinished architectural decoration, thus obviously a usual factor – or even a characteristic feature – of Roman construction. 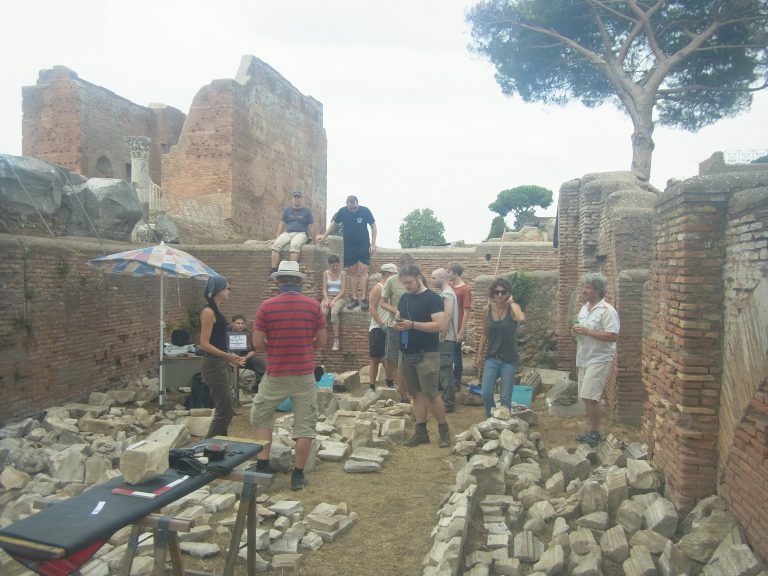 After sufficient smelly business, we started to work at Ostia’s biggest marble-deposit hitherto detected. 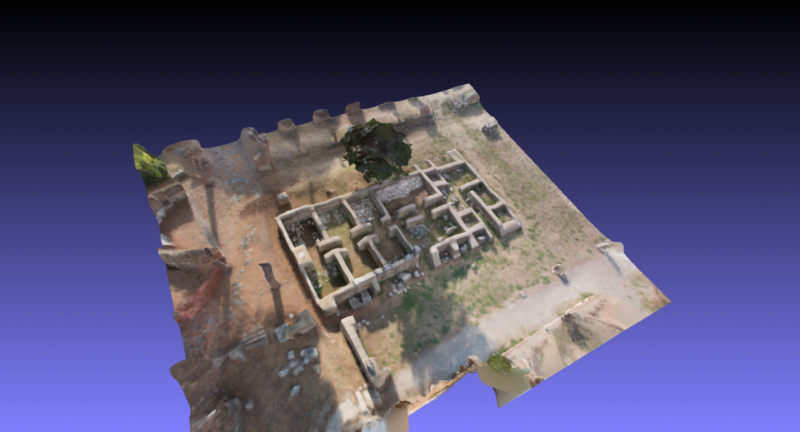 It is situated north of the Decumanus (see plan above and Forum-plan below: TFR 2; see the following four pictures below). 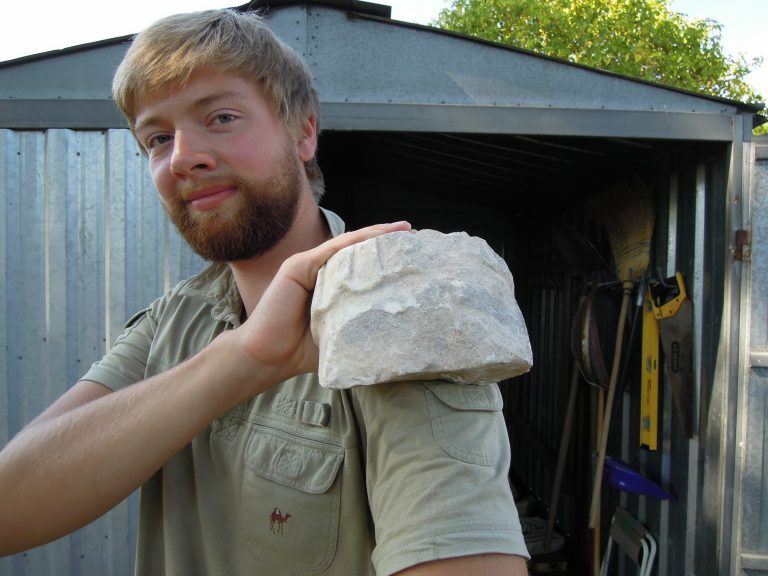 Daniel had already worked superficially in this deposit in 2013, where he had sorted out some coppi (roof tiles) for the research of his master thesis. 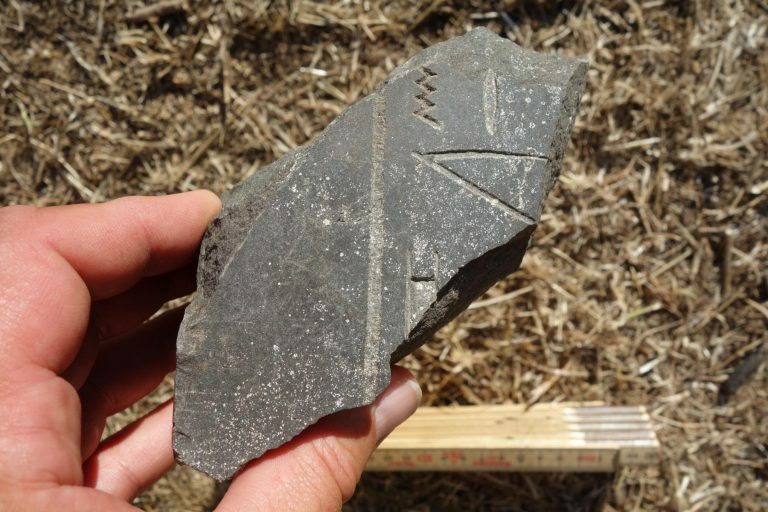 However, it soon became clear that this deposit had not been touched by other archaeologists since its origin in late antique/ medieval times and/or in the 19th or early 20th centuries. 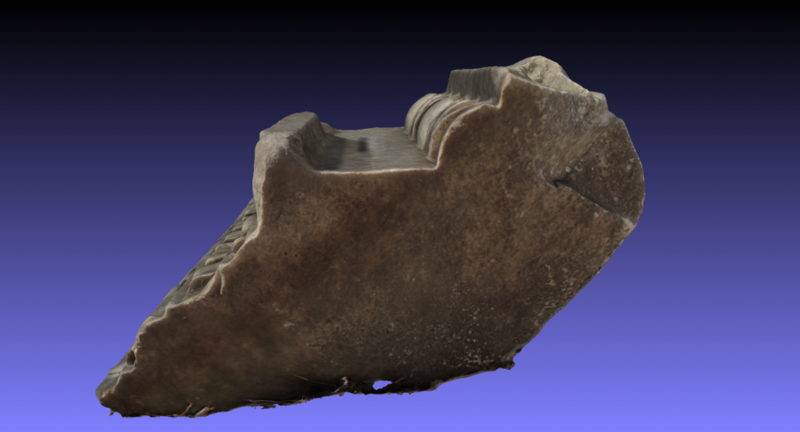 Initially we did not have a proper dating-evidence for the depositing-process. Photos from 1910 documented the existence of the marble-deposit in the room TFR 2. So we knew at least that it had already existed when a nearby lime-kiln was excavated in 1913. 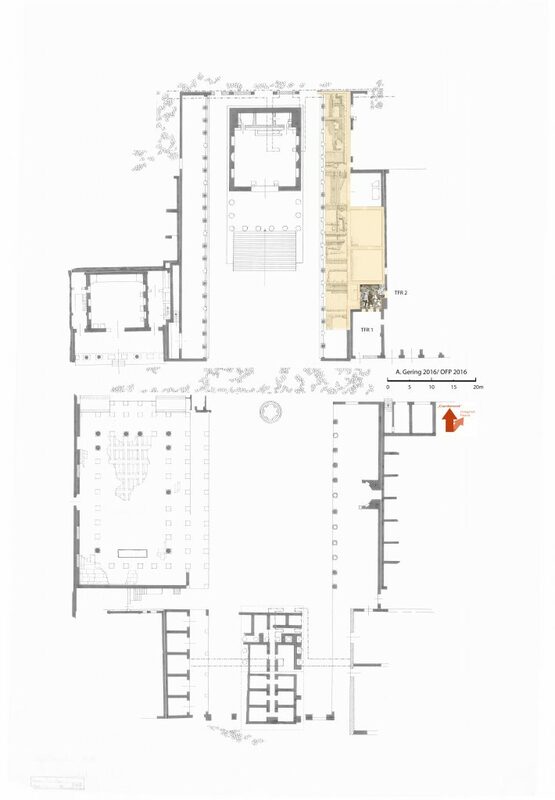 This lime-kiln is recorded only by old excavation-photos and was found next to the excavators’ carriage-track either east of the room TFR 2 or in the south part of the portico located just west of the room TFR 1 (see Forum-plan below). 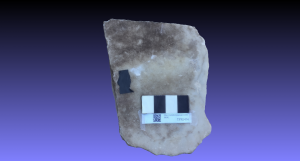 One of the first finds in the room TFR 2 really surprised us a lot: A fragment of an unusual black stone appeared from a pile consisting of white marbles. 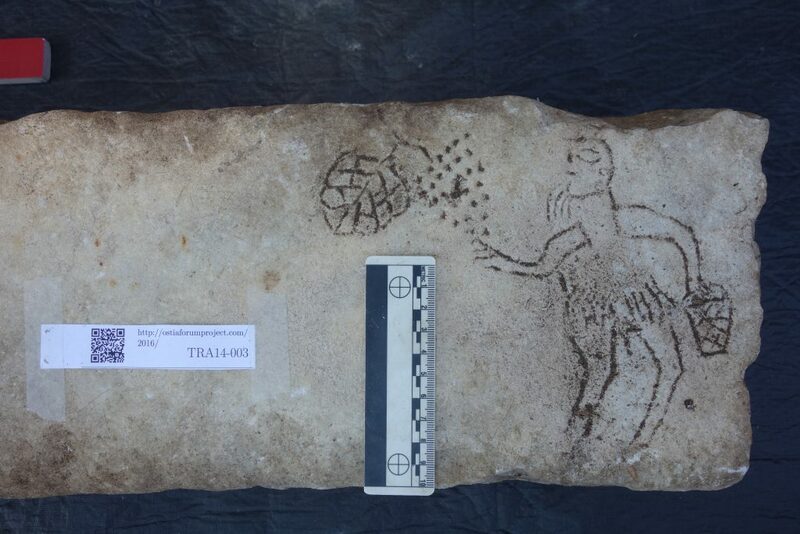 Its surface was covered with hieroglyphs (see pictures below top)! What we definitely did not expect in this moment: It was an Egyptian original being much older than Ostia itself! 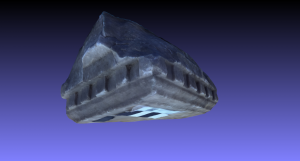 Later this find turned out to be an important hint for the interpretation of the material coming from room TFR 2 as part of a temple-deposit – you can read more about this in chapter 2. 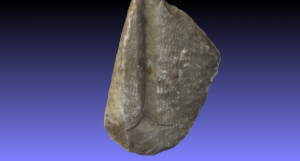 Even though it is a fairly small fragment, due to the typology, we can reconstruct its type completely. It turned out to be an offering plate, which was widespread in Egypt in almost all the dynasties, but in our case of an unusual high quality in execution. 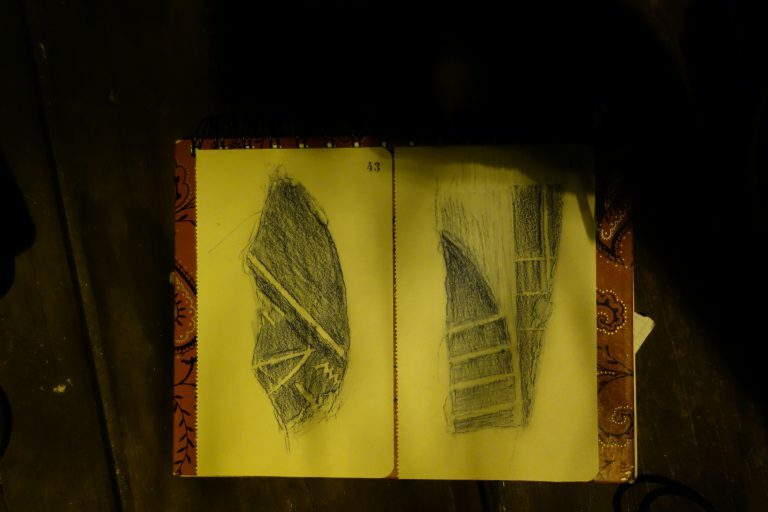 Fortunately, Lena took part in the excavations again, and after a rough hand-drawing (see picture below bottom) and a short telephone-call in the evening, we had the first expertise by Gunnar, who is specialised on this subject due to his PhD. 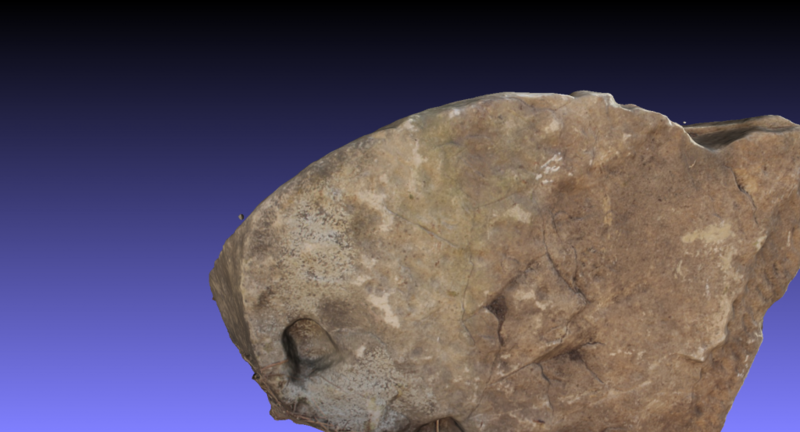 More about this find and the following weeks of excavation, see chapter 2.